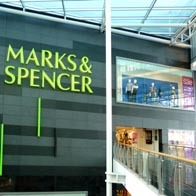 Shop in store or online at Marks and Spencer for clothing, furniture and homeware, flowers, gifts, wine and much more. Women’s Clothing – Autograph, per una, etc. Men’s Clothing – Blue Harbour, Autograph, etc. Customer Toilets, Gift Cards, Money – Cash machine, Car Pickup, Bra Fitting, Places to Eat – Cafe, Baby Changing Facilities, Money – Bureau de Change, Ordering – Flower ordering, Disabled Toilets, Carry To Car, Bilingual Staff Available. The best way to shop is online with direct delivery to your door. Go to Marks and Spencer to get started. Standard delivery normally takes up to 5 days and costs £3.50, but may be higher for larger items. You can nominate a delivery day for £4.95 but this is FREE for orders over £150 when you enter promotion code FREENDAY at checkout. Certain exceptions apply, so it is best the check the website for full details. Items can be returned either by post or to your nearest store.